Do you want to be the first to find out the latest from ESO, the most productive observatory in the world? Check out which of the following newsletters suits you best! Aimed at members of the general public, this weekly newsletter contains stunning images of the Universe, the latest science results from ESO’s telescopes or news about the organisation. Magyarország, Nederland, Norge, Österreich, Polska, Portugal, Schweiz—Suisse—Svizzera, Shqipëria, Srpski, Suomi, Sverige, Türkiye, UK, USA, Россия, Україна. 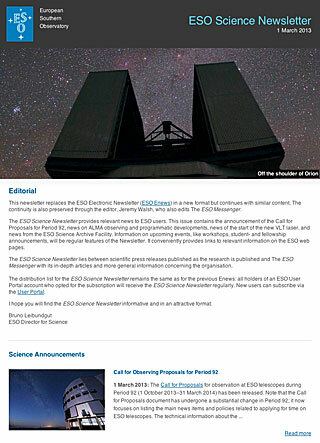 Aimed at the scientific community or anyone interested in more technical and operational scientific news from ESO, this monthly newsletter contains calls for proposals, news on observing and programmatic developments, upcoming workshops, studentship and fellowship announcements etc. 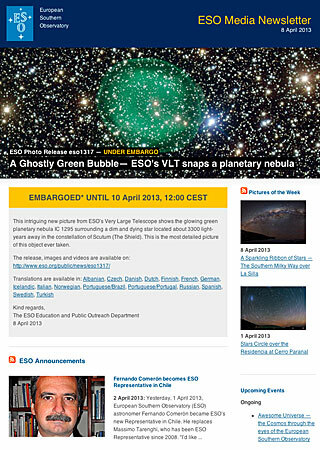 To start receiving the ESO Science Newsletter, please create an account on the ESO User Portal. Aimed at formal and informal educators (teachers, science centres, planetaria, public observatories etc. ), public information officers, science communicators and anyone else interested in astronomy outreach, this monthly newsletter contains latest local ESO events and exhibitions open to visitors, ESO campaigns or competitions, new outreach products, special offers in the ESOshop for educators, new services or products available on eso.org. To start receiving the newsletter, please provide your e-mail address here. In addition, the Depatment of Communication occasionally sends free products via snail mail. To be included in our distribution list, please fill in the address and tick the category you qualify for in the form above. Aimed exclusively at media representatives from traditional media outlets, but also bloggers, freelance journalists, TV broadcasters, researchers and movie producers this is a weekly embargoed newsletter, sent 48 hours prior to the publication of press releases. 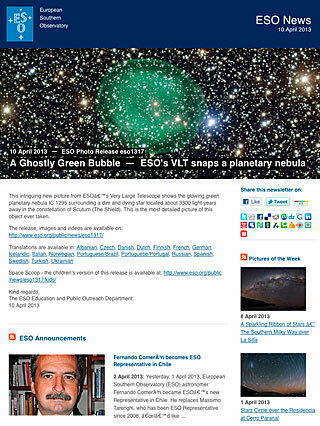 It contains advance access to ESO press releases and accompanying material such as videos, images etc., the latest videos and footage available for use in documentaries, movies, video news etc. 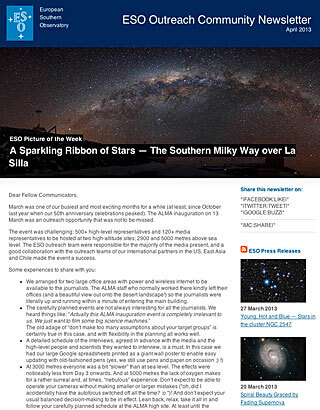 The ESO Media Newsletter is available in your language and for your country. You can choose from the Subscription Preferences from the following options: Australia, België—Belgique—Belgien, Brasil, Česko, Chile, Danmark, Deutschland, España, France, Ireland, Ísland, Italia, Magyarország, Nederland, Norge, Österreich, Polska, Portugal, Schweiz—Suisse—Svizzera, Shqipëria, Srpski, Suomi, Sverige, Türkiye, UK, USA, Россия, Україна. More information for the press is available here.